05/15/10 Update: Extreme cold is not the only thing to worry about in winter! 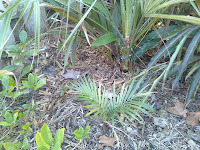 Prolonged cold can slowly weaken plants as they lose vigor and here in Florida, winter is also accompanied with a lack of rain. I have added updates in red, noting which plants succumbed to prolonged cold, winter drought or otherwise, as well as which plants have recovered by May. Some plants could have been saved with additional protection, but since this is for experimental purposes (and I live 40 minutes away from the garden) I allowed the more tender and wimpier plants to die. With a little more tlc I feel that all of these plants could make it if you try hard enough. If you have any questions don't be shy; that's what the comments are for! 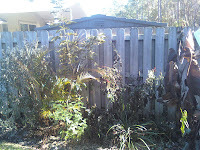 Here it is, a comprehensive (translation: long winded) damage report of what countless nights in the low 20's with drying winds and frost will do to the rainforest garden. 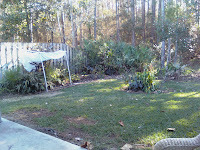 Temperate plants, including natives like hollies, live oak or wax myrtle are not included for obvious reasons. I have not listed any bromeliads, because none were harmed despite having ice in their cups every night. I am very excited with the results of this trial, since everything is alive for the most part, and the least damaged plants are those that will form the canopy and the backbone of the design. 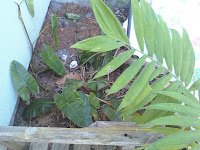 There were some hardiness surprises, but what excites me most is the success of my south Florida natives such as Pond Apple, Red Mangrove, Leather Fern and Wild Lime. May it also be noted that the very same Tillandsia Fasciculata that covers the branches in the everglades is also unharmed. Maybe this year I can get my hands on a Strangler fig! Hope this helps you guys! The yard doesn't look great, but doesn't look devastated either. When the canopy plants get larger and the understory plants like ginger fill in it will get a lot less damage. Passiflora Edulis (Passionfruit) Most exposed leaves melted, closer to ground, no damage. I started it from seed in summer, so I hope it makes it. Passiflora "Incense" Wilted, will recover. Alpinia Nutans (False Cardamom) Outer leaves are dried out, but plant is healthy. 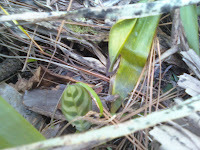 Hedychium Coronarium (White Butterfly Ginger) Burned to ground, will return. Epipremnium Aureum (Golden Pothos, Chartreuse) No damage! Callistemon Citrinus (Lemon Bottlebrush) No damage. Ficus Carica (Edible fig) Leaves looking wimpy, but its fine. Yucca Elephantipes (Giant Yucca, Spineless Yucca) No damage. Agapanthus Africanus (Lily of the Nile) Melty except for newest leaves. Crinum Asiaticum (Giant Crinum) No damage! Dietes Bicolor (African Iris) No damage. I am amazed! And congrats in keeping them healthy. Many times I find ferns like prayer plants (Calatheas) are difficult plants. Their leaves tend to dry out either due to too much water, too little water or scorched by the sun. Is your Yellow Poinciana a dwarf version? Nonetheless, I am sure it is going to be a pretty plant later ;-) I like your collection of tropical and sub-tropical plants! RFG, thanks for this comprehensive list. I will be using this to assess any new purchases I make. I think we live in the same zone (9). I can't believe your pentas are just wilted, not fried. Mine were the first plants to go in my garden this year. The tips of my plumerias look bad...wish I had taken cuttings!!! My experience is that cold damage on plumerias spread and may consume the whole thing before all is said and done. (I've been growing them for a few years.) Last year, we had a severe freeze here. I thought mine were surely dead, and my sister thought she had lost hers. But they came back from the roots! Very pleasant surprise. And I swear I found the new growth the very day I went out to dig them up. of pests and or diseases. seeds. It would certainly do well down there. You do have a rich variety of plants here and I just love the rainforest here. Thanks guys! It doesn't look a whole lot like a rainforest lets say in... Malaysia, right now but that's the challenge, right? After a couple nights of frost there's been more damage but the only thing that i expect to die is the coffee. Your blogs are all very inspiring and your comments are much appreciated. Thanks again!